One of the greatest obstacles a historian must overcome is the tendency of people to believe wide-spread and long-standing legends as fact. And nowhere is this a greater problem than in the history of America's western frontier, starting with Davy Crockett and Daniel Boone and continuing through Wyatt Earp and Billy the Kid. A fictional character is just that, the product of someone's imagination. But a real person who is fictionalized is still a real person, and many people believe that if the person is real than so are the stories that are written about them. Numerous historical figures were created by writers who specialized in this type of sensational fiction popularized by the notorious "dime novel". Many of these "legends" tried hard to live up to the readers' expectations--others tried hard to live it down. A historian, when researching and writing about a particular historical figure, must take all stories into account, then either prove or disprove them, culling out only the "facts". In many cases, the facts are few. 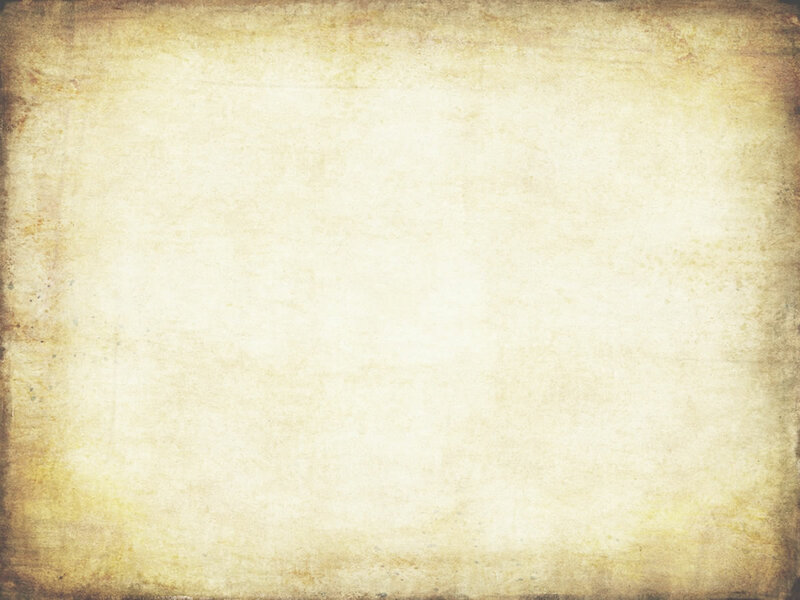 When writing about these individuals the historian may include the various unproven accounts, taking great care to indicate that they are unsubstantiated. When a noted historian fails to do this, he or she is simply fueling the fire of legend. Such is the case with the story of the Mother Lode's legendary bandit, Joaquin Murieta. On May 11, 1853, California Governor John Bigler signed a legislative act authorizing the organization of a band of California Rangers under the command of Captain Harry Love. Their purpose, to capture or kill a "party or gang of robbers commanded by the five Joaquins", specified as Joaquin Botellier, Joaquin Carrillo, Joaquin Murieta, Joaquin Ocomorenia, and Joaquin Valenzuela. These men were believed to be responsible for the majority of all cattle rustling, robberies, and murders perpetrated in the Mother Lode region since 1850. In July of 1853, a group of Love's rangers came across a group of Mexican men near Panoche Pass in San Benito County. (This pass lies some 50 miles from Monterey, in the Costal Mountains--over 100 miles from the Mother Lode region.) A confrontation occurred, and two of the Mexicans were killed. The rangers cut off the hand of one and the head of the other, and later placed them in jars of alcohol to preserve them. They claimed the badly mutilated hand to be that of the notorious "Three-fingered Jack", and the head to be that of Joaquin Murieta. Despite the fact that no positive identification of the detached appendages could be made--and despite the fact that only one Joaquin was alleged to have been killed, the governor paid a reward of $1000 to Captain Love, and the matter was considered settled. (Later, apparently for no logical reason, the legislature approved an additional $5000 bonus.) Those, are the facts. In 1854, a San Francisco journalist who wrote under the pen-name "Yellow Bird", published a sensational and highly fictional account of the life of Joaquin Murieta. It tells of a handsome young Mexican whose wife is raped by miners, and whose brother is hung for a crime he didn't commit. As a result of these atrocities, the young Joaquin swears vengeance on all Americans, forms a band of "cutthroats", and proceeds to rain havoc on the hated "Yankees". At least until he is captured and decapitated by Love's rangers. That, is the legend. The alleged head of Joaquin began a tour of California, being displayed at only the finest establishments specializing in the showing of dismembered limbs. Many viewing the pickled part nodded knowingly, "Yes, that's Joaquin, I worked next to him in the mines." 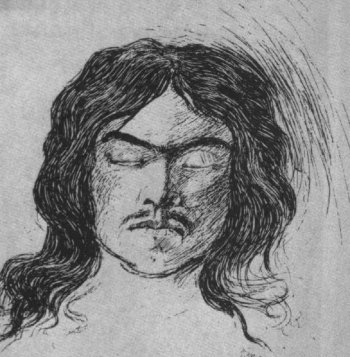 A young senorita, claiming to be Murieta's sister, denied that the head was that of her famous brother bandito. That, was the sideshow. Throughout Gold Country, the Murieta legend grew and flourished. It seems that the dashing Joaquin stayed in every hotel, drank in every bar, and robbed every town from Grass Valley to Mariposa and beyond--quite often all in the same day. Even the author of Amador's county history, J.D. Mason, got into the act when he wrote in 1881, "This renowned bandit commenced his career in this county." He then proceeds to give accounts of Joaquin stealing a horse and killing the owner of a "public house" in 1852. Talk to any 12 Mother Lode "old timers" and at least 6 will tell you a story of how his or her grandfather, grandmother, or someone their grandparents knew actually met or were robbed by the legendary Joaquin. 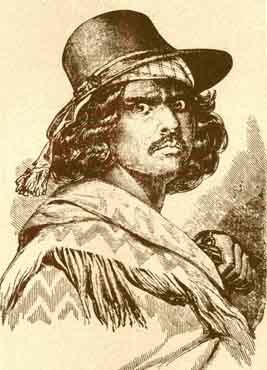 This image was in the Murphys Museum* and claimed to be "the" Joaquin Murieta. The "truth" is, it is a ferrotype c1860s of Frank Marshall Sr.
which was donated by the Marshall Family "by mistake" as an 1853 Dag of Joaquin. In Calaveras County, the Joaquin legend was represented by the one and only alleged photograph ever taken of the bandit. Frequently published over the years, the original image now rests in a display case at the Old Timer's Museum in Murphys. The story goes that the picture is a daguerreotype given to Constable Ben Marshall who came to Murieta's aid during a run-in with whites at a gambling tent in Murphys. It is true that in 1850, when this incident supposedly occurred, portraits were taken by the daguerreotype process, a method that produced a distinctive image on a silver-coated copper plate. The picture in question, unfortunately, is not a daguerreotype (assuming that the one on display in Murphys is the original). It is either an ambrotype or tintype, two similar processes that were invented in 1854 and 1856, respectively. 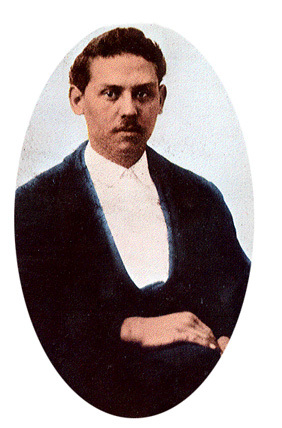 If it could be proven that this image was actually Joaquin Murieta, photographed a year or more after his alleged demise, it would also be proof that Captain Love received an unjust reward. As for the Marshall story, it is not unlikely that the future sheriff of Calaveras County met and befriended a man who called himself Joaquin or even Murieta. Whether or not this was the Joaquin Murieta we will never know. It is a fact that California's Mexican population, in general, were badly mistreated by Americans and as a result of this mistreatment, many of them turned to a life of often vicious crime. It is a fact that many of these criminals bore the name Joaquin and it is likely that many more took that name as the Murieta legend grew. When the "Five Joaquins" act passed the state legislature in 1853, the appointed rangers were cautioned that there were numerous "respectable citizens" who bore the same names, including a Judge Joaquin Carrillo. Was there, then, a real Joaquin Murieta? Probably. Was he the "legendary" Murieta? Probably not. While the legend has basis in fact, it has been proven to be mostly fiction. For a wonderful and thoughtful look into the legend, read "Bad Company" by Joseph Henry Jackson, 1939. The Life and Adventures of Joaquin Murieta: The Celebrated California Bandit by San Francisco journalist John Rollin Ridge, gave rise to much of Murieta's legend. According to this unsubstantiated story, he had come to the Stanislaus River near San Francisco to prospect for gold during the great gold rush. However, according to Ridge's work, Murieta's Mexican heritage caused him to be beaten and severely whipped, his wife raped, and his brother-in-law killed in an unprovoked attack by racist Americans working their own claims. (Ridge had witnessed his father and grandfather murdered by racist Cherokee's who did not like their mixing with whites) Vowing revenge, Murieta formed a gang of Mexicans who roamed the frontier towns and terrorized prospectors and new communities. Ridge's book became popular after the turn of the 20th century and it inspired several copycat works. Murieta was characterized as a Robin-hood type figure, a Mexican rebel leader, or a vicious outlaw, depending on the author's perspective. In the 1997 film Mask of Zorro, Murieta appears as Zorro's brother. In Isabel Allende's Daughter of Fortune, he is a Chilean hero. The legend of Murieta has continued to this day. *Old Timers Museum Opened in 1949 (closed 2018) by Dr. and Mrs. R. Coke Wood to honor the still-living early settlers and their descendants, the Old Timers Museum of Murphys in Calaveras County has preserved many significant artifacts. This non-profit museum is located in the oldest structure in Murphys (1858), the Peter Travers Building and the west wall, the ECV Wall of Historic Commemorative Ovations, is of particular interest and amusement. Open September-June Fri-Sat-Sun 11 am-4 pm; Open Mondays 10:30-4:30 during the summer. Donation $ 1 adults, 50 cents/children. Write 11 Knolltop Ct, Novato, CA 94945.